This picture was taken the night of April 4, 2011 by my son who was lying on my bed and taking random pictures with his iPhone. 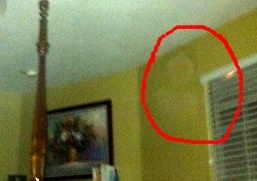 To his amazement, he saw the outline of a ghost-like head, face, and shoulders which is now circled in red. Upon closer examination we realized the ghostly image in the picture was his Grandmother (my mother-in-law) who had passed away a few weeks earlier. She was 68 years old and absolutely adored her two grandchildren ages 14 and 20. It's so great knowing our loved ones are watching over us and this picture proves just that. I think its nice your Gran is looking out for you. My Grandmother died years ago and while I've never seen her ghost or any other that I'm aware of, I know she is looking out for me. She visits my dreams at least twice a week, especially when I'm having a stressful time. Treasure her memory and her picture.